All orders are shipped via the US Postal Service for the same low price! Our NEW surface mount LED units & LED Inserts (for Polaris), NEW ISR Race Battery LED taillight, and great taillights and/or third brake lights. It is a two function light, (stop & run) and will work on any 12 volt electrical system -with or without a battery. Surface mount in two styles, clear lens short unit in 2 sizes (4 or 5"), and red lens long strip light. Very light. Sold per each unit- one light strip. Also have a nice "L" shaped aluminium bracket (BL-TLEDBR) to make installation of the 4" strip a snap. 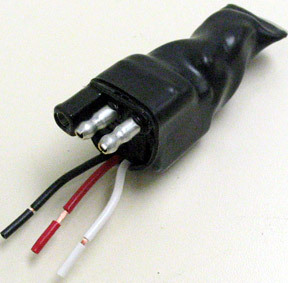 This is a molded adaptor designed to convert the taillight wiring harness on all Polaris CFI snowmobiles (2005-current) like the Dragon, anything that has the Clean Fire Injection fuel management, to make a LED taillight function properly. Will also work in Can-Am ATV's. The stock taillight wiring on the CFI models use a non-typical set-up with one positive and two ground wires. The Brite Lites CFI Adaptor will reroute the wiring so it is a standard one wire ground and tow wires positive (run & brake). the adaptor is built with a 3 pin molded plug like the stock wiring, so you just plug it in, and three wire out, to splice into the new LED. It will work on any 3 wire (2 function) LED, but is matched for our 4" strip LED. Sold per each. Clear Lens version is out of stock - only RED lens available.These are �LED units for universal fit to replace or add taillight to any 12 volt system. 6 LEDs are mounted with a clear lens to make it the most luminant LED bulb ever made. Rated life is 10,000 hours and draws virtually no electricity (about 15 milli-amps). Uses a small 3.86" x .71" flat surface footprint, and stands only .95" tall. The wire is a three wire configuration, one ground, a hot for run and a hot for brake circuits. LEDs are polarity sensitive so be sure to connect ground to ground or it will not light. The white wire is the ground, black wire is run, and red is stop. (you can't damage it if you wire incorrectly- it just won't light) Only 1.1 oz. sold per each light. This kit includes all 3 bulbs to do the run and brake on a standard Wedge chassis type taillight. This is the taillight that is in the back of the seat with a larger bulb in the center for brake, and 2 small bulbs on the outside for run. Red LEDs on a red lens gives the most usable light. Kit of all 3 pieces for conversion. 8 LED's in a sealed light bar base for the stop/run taillight on the rear of any vehicle. Designed to fit as a custom taillight or add to give extra safety. 3 wire connection. Brightest and widest dispersion angle available. Molded in clear plastic lens, Red LEDs, sealed water tight, with black removable rubber base. Connect wires to ground, run circuit, and brake circuit, of if no brake needed and to use as auxuallary light, connect just the brake (the brighter) circuit for a center light on trailer, or marker light. Cool euro look and brilliant red light!! Uses a small 4.75" x 1.4" flat surface footprint, and stands only 1.1" tall. Mounting holes are 3.75" c to c and wires exit from center back. Sold per each light. New ISR Race Oval designed LED taillight kit for the new race rules. Aluminium bracket fits onto the chassis, wired for toggle switch operation off enclosed battery. No wires or anything else needed to use, just bolt on and race!! Super simple kit, super bright. Battery lasts for days and can be changed in minutes right at the track! Comes with batteries. Sold per each light kit. Simple Aluminium bracket to allow for quick placement of our 4" Euro LED strip (BL-TLEDR). Is pre-drilled to mount the rubber gasket to the bracket and then mount the "L" bracket to the sled chassis. Sold per each. New PC Board designed LED taillight insert for the Polaris IQ chassis snowmobiles ('07 to current)and will fit PRO X seat. Fits into the stock taillight, stop/run function, plugs directly into the bulb connector inside the taillight (replace the stock 1157 bulb with this insert). Brightest and widest dispersion angle available. 2 versions are available for the CFI & non CFI engine machines. A CFI engine is a Polaris with the Clean Fire Fuel Injection, so the 600, 700, 800, & 900 sleds have the CFI, 7's thru 9's are ONLY CFI. 600's can be a HO carb or CFI. This iten is the non CFI, or regular taillight for the 500, & 600 HO machines. The CFI ones are p/n BL-TLEDPOLA and are $49.99 ea. Sold per each light. PC Board designed LED taillight insert for the Polaris IQ CFI & FST snowmobiles. Fits into the stock taillight, stop/run function, plugs directly into the bulb connector inside the taillight (replace the stock 1157 bulb with this insert). Brightest and widest dispersion angle available. 2 versions are available for the CFI & non CFI engine machines. A CFI engine is a Polaris with the Clean Fire Fuel Injection, so the 600, 700, 800, & 900 sleds have the CFI, 7's thru 9's are ONLY CFI (Also the FST 4 strokes are electronic fuel mgt). 600's can be a HO carb or CFI. This item is the CFI model, or adaptor taillight for the 700, 800 & 900 machines. The non-CFI ones are p/n BL-TLEDPOL and are $39.99 ea. Sold per each light. 12 Super Bright LED's in a sealed light bar base for the stop/run taillight on the rear of any vehicle. Designed to fit as a custom taillight or add to give extra safety. 3 wire connection. Brightest and widest dispersion angle available. Molded in clear plastic lens, Red LEDs, sealed water tight, with chrome removable metal bezel. Connect wires to ground, run circuit, and brake circuit, of if no brake needed and to use as auxuallary light, connect just the brake (the brighter) circuit for a center light on trailer, or marker light. Cool euro look and brilliant red light!! Uses a small 6 3/16" x 1 7/8" flat surface footprint, and stands only 15/16" tall. Wires exit from center back. Sold per each light. © Copyright , Bluhm Enterprises. All Rights Reserved.